first of all I'm sorry for my terrible English. I'm just arrived in the ultimaker world, my um3 have one week and I am excited about the print quality, a little less than other things. The first day I did the calibrations and then printed many cubes of various sizes and other shapes to check the measurements in the 3 axes. I used only Ultimaker filaments (pla, abs) and printcore 0.4 or 0.25., Cura as slicer with default settings. I only lowered the speeds bringing the maximum to 50mm/s and the walls to 20-30mm/s. 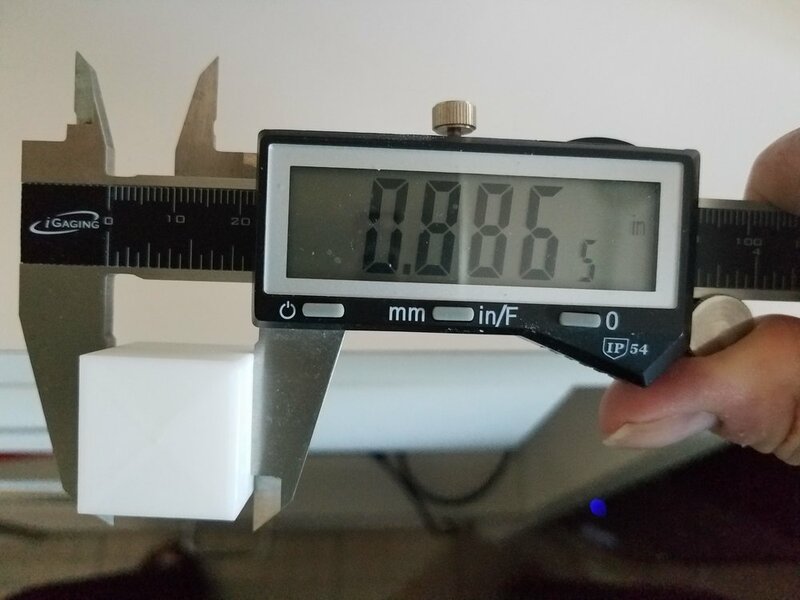 In all the tests I did, I always have the Y axis a bit more then X axis about 0.1 / 0.16 mm. In this phase I would like to calibrate the various axes with similar tolerances without worrying too much about the exact measurements. The exact measurements I would do later, depending on the materials using the slicer with "horizontal expansion" or by scaling the model. All impossible things to do if you do not have the same tolerances on the 3 axes. I have already read all your various measures concerning the measurements and I checked the tension of the belts, the fluency of the print head and the lubrication of the axles. Everything seems good. I exclude to change the original cad file, I use the printer for prototyping parts that will then be produced with traditional methods, so it would be risky to produce parts with incorrect measurements. Thank you for the help you can give me. The printer is new and I need to understand if this is normal or my UM3 have some problems. You will always have a difference between the dimensions, but maybe not so much as you have. First of all, you should be careful where you measure, because the corners could be bulged out and also the bottom of your object (aka elephant foot). So just measure from the top and not the whole side as on your pictures. You should check if your axles have some play if you try to move them. Hold your printer frame with one hand and try with the other hand to move each axle. They should not move and you should not hear a click sound. You should check all four thicker axles, not the 2 through the print head. 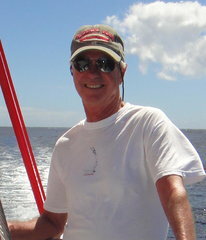 Checking belts and lubrication, but I think you have already checked it. I make many measurements at various points including the measure that you suggested to me. Unfortunately, the result does not change. I will check my axis like you suggested me, but... is eally new printer and not cheaper.... I thought I did not have these problems with ultimaker. My UM3 is 2 months old and I had 2 axles a little bit loose. Could also happen on the transport from Ultimaker to your local reseller. It is also something you should check from time to time, as suggested in the maintenance section of the manual. Check the Ultimaker website, there is a complete description how to check the axles and if loose how to tighten them an calibrate the print head. I worked all day trying to solve the problem. All 4 assis had a lot of play and I did 2 times the suggested procedure on the ultimaker website "maintence - check for play on axis". The result is not good, the difference between the two axes x, y remains always about 0.15 mm. It does not seem right to me that a new printer needs to be repaired for the correct operation byf the customer. I just have a china printer for that! ? Thanks @Smithy for your good support. I hope reseller will change my printer with new one. Do a factory reset. Maybe there is something wrong in your software. That all 4 axles of a new printer have play, seems not normal to me. Maybe a transport damage and an axle is a little bit bent or something like that. I must say Giovanni you peaked my interest with your cube measurements. I print most objects much larger than your cube but sometimes smaller threaded objects (neck finish of bottle) where a cap must be screwed on, and I never see the kind of variation you have described. 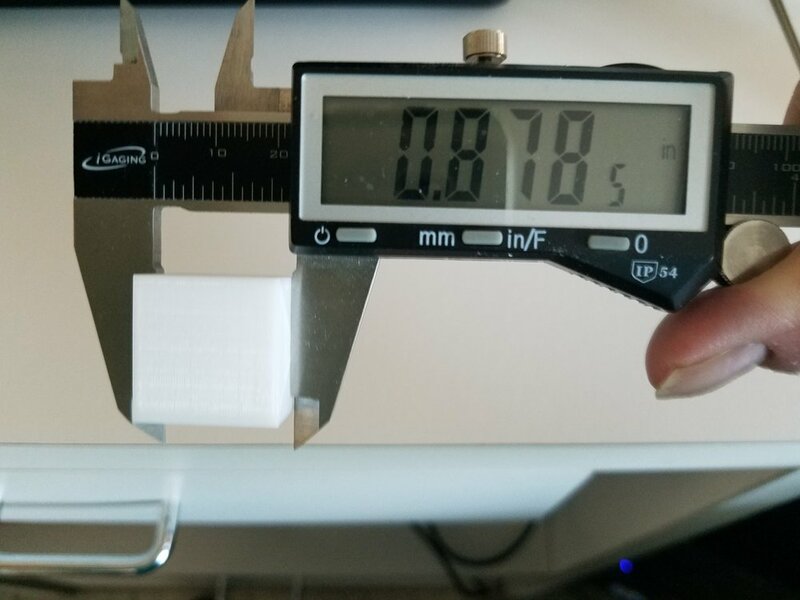 Here are photos of a cube I printed that is .875" (7/8") on a side. I chose that size arbitrarily, but it is close to your cube. The Z is only off target by .0035" (0.09mm), and while the X & Y are some .012 (0.3mm) larger than the target, they are within .0015" (0.04mm) of each other. I don't think you can expect results much better than these figures from an FDM printer. Hope this gives you some insight into the capabilities of the UM3. I would be happy to have your results. I printed other parts more complex with same problem. I think cube can be the easy way to check if printer is good. 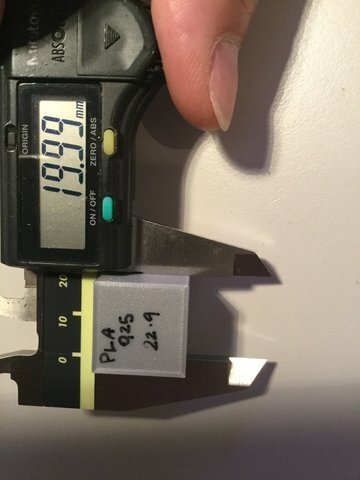 Printer speed: outer wall 12mm/s,inner wall 17mm/s, 20% infill, ultimaker pla at 190 with 0.25, 205 with 0.4. I have this difference from the first print I made and I do not think it's ok! ? @Smithy nice idea, I will try but... I will lost all my settings... ? You might need to get a um2go if you want dimensional accuracy better than this. I'm not sure which of the json files to edit either. You can do a grep or guess. I'd just try editing both. You should definitely buy this recovery cable from olimex. I sell some in my store but only for USA customers. The company is in europe. Since you know Linux I can explain that if a json file is corrupted (missing a comma, or semicolon, or quote) the linux box will boot but fail before ssh shell is started so recovery is impossible with ssh. But if you have the olimex cable it's easy to login and fix the json file and reboot. You want the long belts to be at about 100-120Hz. If they are too tight it might increase friction and increase backlash/play. You shouldn't have to mess with them as they have a spring inside the black box that the belts go through but you might have to loosen a pulley to equalize the tension if the belt jumps a tooth (happens to me when other people transport my printers and they grab it by the cable). ALSO make sure the short belts are tight. You can loosen the 4 screws on the stepper from the outside and then push down hard - maybe 2kg of force - on the stepper while you re-tighten them. You don't have to remove covers to do this - just use a stick to push down on the stepper. It's also possible to have play in the print head bearings - one of the bearings isn't all that tight in the print head on some UM3s. But I think that's been improved - not sure. Ultimaker keeps improving their printers without making a big deal about it. 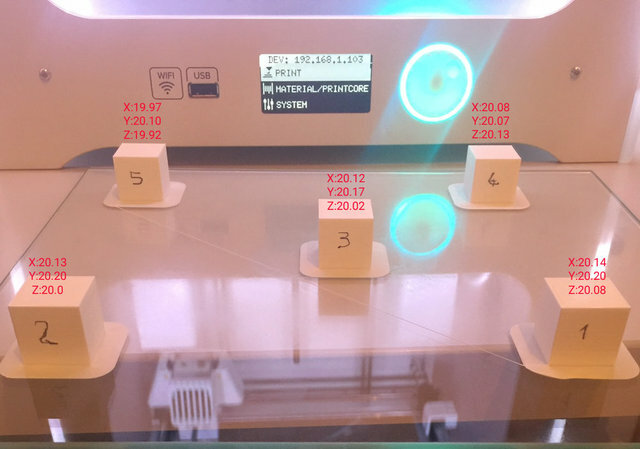 Printers from China of course are going to be better quality for the price than a european printer because labor is cheaper there so you won't always get better quality. Many China printers are really crap but some are probably quite excellent. Smaller printers tend to give you better tolerances. I love my um2gos as they print so beautifully. My UM3 is great because it prints PVA. You mean that I can't have better then 0.1mm difference between x and y? Thanks, nice to know this. I will buy the cable, just need to find one store. You want the long belts to be at about 100-120Hz. you taught me how tensions should be verified. I just try with an app and result are not good... I have value between 60 and 100Hz. I tested with 2 different app but maybe the app is not the best choice. I need to learn how to check it and in case how to repair. I had done it the first day and I think they are ok.
today I'm doing 3 test objects with the two printcore (0.24 - 0.4). At the moment the 0.1 remains and the z is still too big. Many thanks @gr5 I learned a lot today from you. I printed a lot of test pieces. Cube 20x20, step-xyz calibration of two different sizes (100x100x50) and (50x50x50) with the printcore 0.4 and 0.25. With both printcore I always have a difference between x and y. Y is always higher between 0.06 and 0.1 mm. Difference between printcore is the same. I also noticed that 0.2 layer height makes larger measures of about 0.1mm then 0.1 layer. I therefore decided to check if the position in the bed pllate influenced the measurements. For this test I activated active leveling because my plate is warped. I checked again the glass and is ok. I checked aluminium base plate and heated bed. Both are deformed. I don't know if this can be the problems on my measures. What I can do? I need to change aluminium base plate and heated bed? Listening to sound I think maybe your shafts are a little loose - grab each of the 4 shafts and push them towards their ends. They should not slide. No more than 0.2mm I suppose. Or none at all. If I am right, one of the 4 shafts is sliding. I'm not sure if this affects print quality much or at all. It might. The fix is simple - loosen the set screw on one of the pulleys on either end and push the pulleys outwards until they stop then re-tighten. There is a black plastic spacer/bearing that keeps the pulley from going all the way to the wall. I could be wrong - it's just that is what it *sounds* like. Two photos above you show a ruler checking flatness of large bottom plate - that doesn't matter. Your print bed is supported by exactly 3 points and those matter but the bottom plate can be very warped and it's no problem. It just needs to support the 3 screws to a level position with a few mm. The x,y,z measurements of the 5 cubes 3 photos above look typical except for one - the Z value in cube 5 surprises me. I thought you said that corner was low. 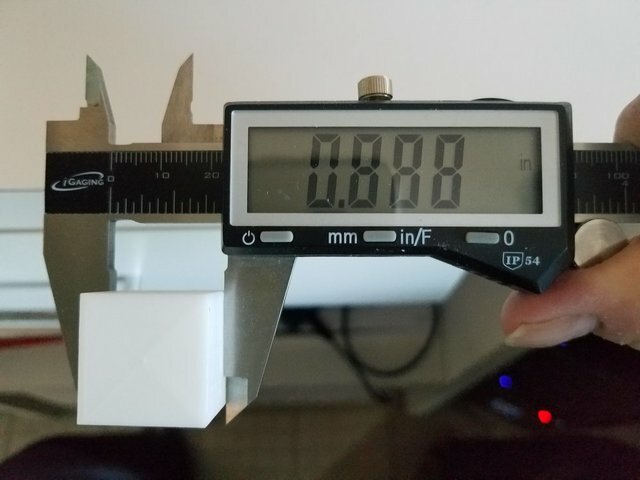 I would expect that cube would be at least 0.3mm too tall yet it is shorter than the others. So maybe your bed is flatter than you thought. Other things that can affect dimensionality are over/under extrusion. So if the feeder experiences extra friction the filament will slip in the feeder a bit even though it's steel gnurled wheel pushing on the filament - if you measure the holes in the filament created by the feeder they will be closer together when it's pushing harder and the holes will be elongated. 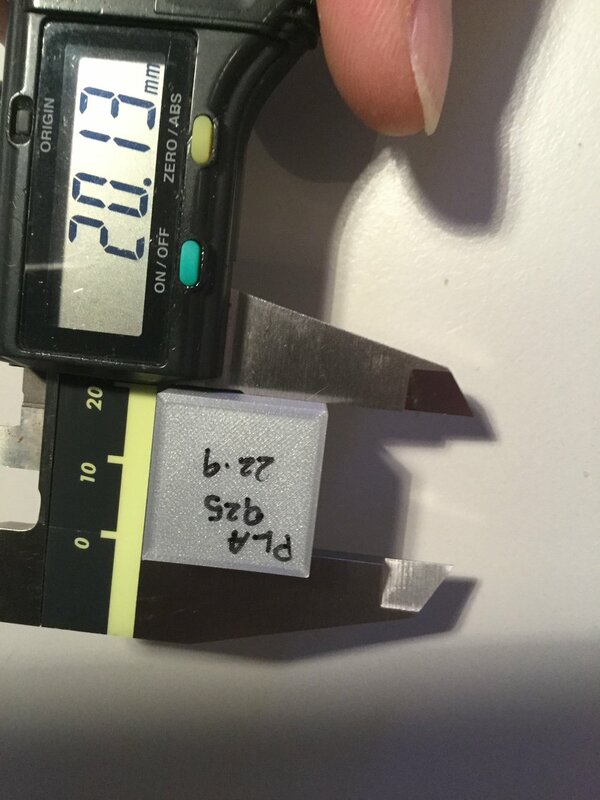 Typical printing underextrudes by 10% so you would expect that the 0.4mm outer traces would add up to an error of about 0.04mm typically (dimensions smaller than expected). The bottom layer typically sticks out farther because you want to squish this layer so the part sticks (if the part comes loose during a print it can be a disaster for your printer causing something called a "head flood". Google it. Fortunately never happened to me as my parts stick very well. You can compensite by setting "initial layer expansion" to roughly negative half the nozzle width - I like -0.25 for 0.4 nozzle. Corners can bulge out if the print head slows down - often the printer overextrudes one or all corners. Temperature affects extrusion amount. Lower temperatures you get better quality but more underextrusion (if you get up to 20% underextrusion now it's 0.1mm error on the outer walls). Bed temperature affects this. Fan speeds affects this (faster fan is better for PLA). PLA color affects this - for example white PLA is the most difficult because it has so much colorant (chalk?) and less PLA. White filament is less viscous so flows faster and doesn't underextrude as much unless you lower the temperature to compensate. Lowering the temperature also helps the quality of white filament particularly. Printing speed affects this because if you print faster it tends to underextrude more. 10% underextrusion is typical and normal and results in excellent prints. But it's still underextruded. I think my shafts are fine now. I con't move them. I think that sound come from print head, but printcore are fixed. Maybe Is one fan moves in fast movements. Two photos above you show a ruler checking flatness of large bottom plate﻿ - that doesn't matter. I thought you said that corner was low﻿. Maybe with my English I did some mistake. Sorry me. Really thanks for your support @gr5. Really appreciate. Yes I understand all problem about measures. What I hope to have is same dimensione on x,y axis. I thought you said that corner was low. what I meant was that the heated floor was lower in rear left corner, but glass was and is straight. I have and I had a problem to calibrate plate if I screw the 3 screws of plate and then put them at same misure the the nozzle is too low in the two front corners. So i need to chenge height at the center rear and restart procedure untill I find a good measures. I'm still working on my UM3 calibration. I slightly improved the difference between x and y, now is about 0.05 - 0.07. I always find a difference on the Z axis, so I printed a test object. 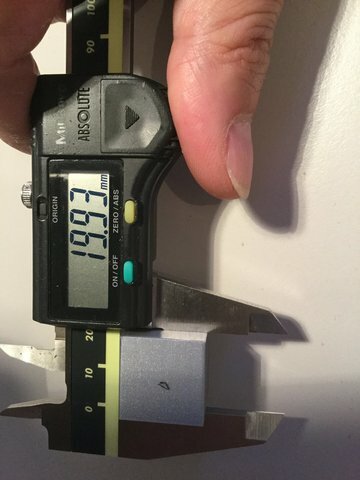 There is some way to improve Z tolerances. After 70mm they become quite important for what I need? I also tried to solve the "sound" but without success. I'm almost certain to arrive at the print head but I have no idea what it is generated from. Really thanks and sorry if I annoyng you with my measurements! Hi Gio, thank you for sharing your measurements. You don't annoy anyone I think, don't worry about it ? I read through the post, but I don't I found where you said which accuracy you are looking for. Do you have a goal of (for example) a deviation of 100 micron, or 200 micron is acceptable or will you only satisfied with 100% accuracy? Can you share what you want to use your 3D prints for? Thanks Sanderv for your answer I really appreciated it. Sorry me if at this time I can't share what I need to produce. My first prototype will soon be ready and at that moment I will be able to share the project. I hope to arrive about 50 microns, do you believe it is possible? Printed with printcore 0.4 and 0.2 layer, printer speed infill and wall 28, outer wall 19. Just for testing I used layer 0.2. I have a bit better with printcore 0.25 and layer 0.1 but I I have not printed all the object so I reported those made with layer 0.2. Thanks a lot to @gr5 (is available gr5-ebook? ;)) and @Smithy for this result. I will also be happy to remove that "sound". ? 50 micron is really accurate, it may depend on the material which you are planning on using if that is possible but that might be difficult to consistently achieve that. Some materials have more shrinkage than others. In general, a safe margin between 200 and 500 microns should be realistic.